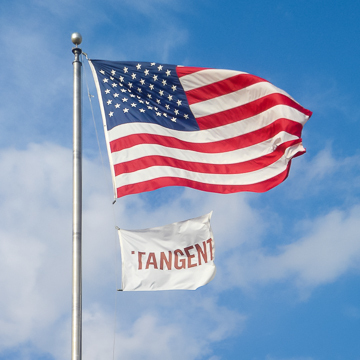 At Tangent Technologies, LLC we believe technology and innovation are MISSION CRITICAL to our—as well as our customer's—continued success. It is so important that we built it into our identity as a constant reminder from day one. Innovation is part of our DNA and it is what excites us everyday. Envisioning the future, we diligently work to deliver creative solutions today. We partner with like minded customers to develop new ideas and innovating distinctive product lines. Execution is equally important. Without it, our mission and vision are just dreams; not reality. We were FIRST to introduce co-extrusion parts in HDPE recycled plastic lumber. We were FIRST to produce HDPE recycled plastic lumber up to 60 inches wide and as thin as 3/8". (Yeah, we even co-extruded it.) We were FIRST to vertically integrate with our in-house PCR recycling operation, giving us complete control over the quality for our raw material. And, we were FIRST to develop streaking and other multi-color (patent-pending) techniques both on the surface and throughout the core of our recycled plastic lumber. Clearly, we like to innovate. We believe the highest quality recycled plastic lumber products begin with the best available raw materials. In our case, we needed to start with a premium quality post consumer HDPE recycled plastic resin. Purchasing PCR HDPE milk bottle resin in the marketplace from a variety of vendors proved difficult to rely upon a consistent quality supply. 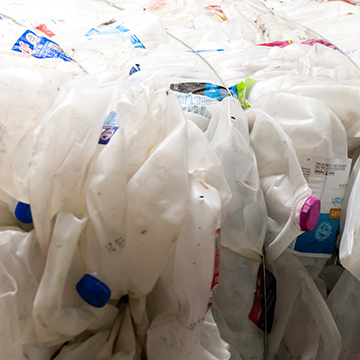 Strategically, we shifted our approach and massively invested in our future by building our own PCR plastic bottle recycling facility in 2010. This vertically integrated recycling process gives us 100% control over the quality of our raw material. This PCR recycled resin facility expansion diverts 15,000 tons/year of HDPE post-consumer milk bottles from the landfill waste stream. That's approximately 210,000,000 plastic bottles recovered annually and given new life as PCR Pure™, 100% Post-Consumer Recycled HDPE Resin which is the base feedstock for all our recycled plastic lumber product brands such as PolyTuf™, TanDeck™ & PolyForce™. We assure accountability of our environmental claims by contracting with Green Circle Certified, a 3rd party firm which independently audits our processes to substantiate our recycled content claims on an annual basis and to ensure we meet the FTC Green Guidelines published in 2012. No other plastic lumber supplier offers the breath and depth of our manufacturing capabilities. Largest production capacity in the industry + 400,000SF of production & warehouse space = shortest lead times for our customers. In house tool making allows us to rapid prototype new shapes and bring to market new products for our customers faster than any of our competition. Quality Control is paramount in day to day operations. We produce the highest outdoor furniture grade recycled plastic lumber in the market place. Extensive range of manufacturing capabilities. Co-extrusion, sheet grade products up to 60 inches, patent pending multi-color streaking finishes, 12" x 12" cross sections with embedded fiberglass rebar for heavy duty structural applications, are all examples of capabilities we have developed to allow our customers to innovate and design their own distinctive products in their marketplace. Our manufacturing capabilities are rooted in "innovation" and "execution" to deliver an unmatched range of capabilities for our customers to build long term product brands with confidence. Co-Extrusion Process. Co-extrusion creates opportunity to design plastic lumber with an exterior surface of one color and composition and an interior core with another. We can combine the best of both to produce an array of plastic lumber products with beauty on the outside and specific performance on the inside, maximizing our customers ability to penetrate new applications. You dream it; we engineer it. Cross Head Extrusion. Does your project require fiberglass rebar embedded into medium to large cross sections for structural load carrying capacity? No problem. Cross head die extrusion allows us to place linear reinforcement at any spot to custom design strength for your unique requirements. Our PolyForce™ Structural Recycled Plastic Lumber brand is can be specifically engineered for these types of applications. In-House Certified Mechanical Property Testing. We can perform ASTM D6109 Flexural Modulus testing on our PolyForce™ Composite Marine Timbers – 12”x12” cross section and up to 30 feet long. This ensures we meet the specifications required by each project as we produce and before it ships to the job site. Plastic lumber sheet up to 60 inches wide. Where else are you going to find that? [Answer] Only at Tangent. 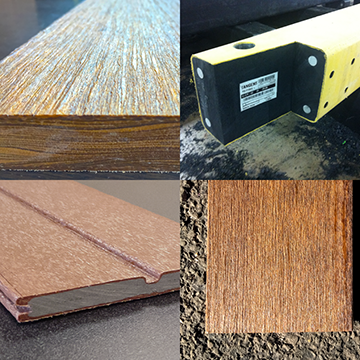 We can match the fit and finish of our wide sheet products to any of our standard plastic lumber profiles to allow our customers to integrate wide and narrow parts to be as creative in their design as they want to be. Patent pending - Multi-color streaking finish. Multi-color tones blended on the surface coupled with rings of color in the core presents an exciting new range of new product development options for our customers. We call it our Exotic Collection. Our customers call it "remarkable"! Challenge us. We love innovation. Our advanced manufacturing facility meets the demands of your project, or we will develop new techniques to do so. 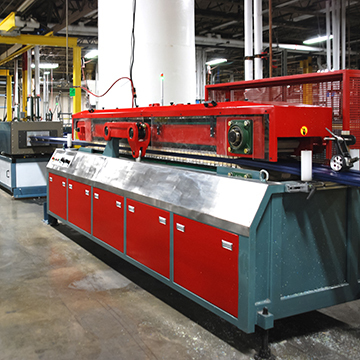 A customer’s challenge to discover new products and enhancements is how we developed our 60 inch wide plastic lumber and co-extrusion capabilities. Our mission is to bring our customers truly unique products they cannot buy elsewhere, giving them a competitive advantage. No project is too small, too big or too complicated. Bring us your ideas and Tangent will develop innovative solutions. R&D is a substantial part of our focus where we invest people and capital resources to open up new possibilities for our customers. Standard or Custom Shapes; the choice is yours. We can extrude virtually any shape or length, with infinite options for color and finish. 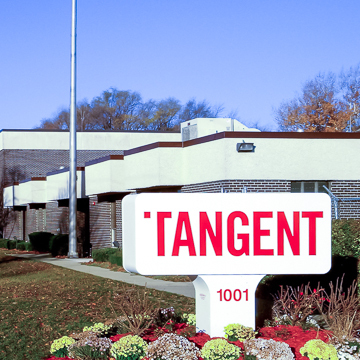 Tangent has over 170 extrusion shapes available in-house. If we don’t have the exact extrusion shape for your application, we have in-house tool making capability and quick turn-around to build what you need when you need it. Color & Finish. We can match ANY color or develop a custom color for your specific application or project. Surface finish directly relates to how color is perceived. We are experts at dialing in and controlling the finish in our process to meet your unique specifications. Need really long lengths? Our plastic lumber manufacturing process is extrusion based not molding into specific molds. This allows us to dial in our quality and produce parts on a continuous & consistent basis. No starting and stopping of filling and emptying molds which can be vulnerable to QC issues. An inherent benefit to continuous extrusion is any length can be produced without new tooling. Widest Width in the Industry. Tangent can produce recycled plastic lumber up to 60 inches wide. No other plastic lumber manufacturer can come close to this ability to offer wide parts in plastic lumber applications. Imagine laying up a single sheet on your CNC machine and cutting a variety of parts. Embossed Finishes. We are developing a wide array of embossing techniques which allow us to offer smooth to rough hewn surface finishes for our customers. Fabrication needed? Sometimes it makes sense to perform fabrication to plastic lumber before we ship. High scrap rate parts, short length precision cuts, large cross sections needing beveled edges are a few examples of Tangent providing cost effective operations for our customers to reduce their overall costs. We have the Capacity to Grow with you. Do you need 5 skids of recycled plastic lumber a month to develop a new product offering? No problem. We likely already have it in inventory. Now that your vision, hard work and investment have paid off, your need has grown to 5 truckloads per week. No problem. 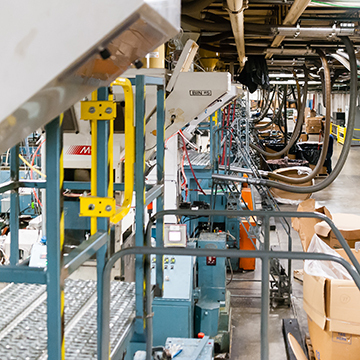 Tangent has the largest production capacity in our marketplace and our continued investment in this capability allows us to stay ahead of our customers growth so they never suffer long lead times or an inability to get product when they need it. We value small and large customers equally. Our purpose is to be "the platform" of which you grow your business from regardless of your size. At Tangent, we understand the responsibility we have to stay ahead of our customers growth. We continually invest in increasing our run-rates and overall capacity so our customers sleep well at night not worrying about availability, delivery or lead times. Win-Win Partnerships are important to us. A partnership with Tangent means that you are committed to a more sustainable future with new and innovative higher-performing products. Trust is key. Earning trust takes time, hard work and always following through on commitments. We actively engage in seeking customers who are innovative, like minded in business principals, wanting to grow their business with a true partnership approach with their key plastic lumber supplier. Call us today!